Over the years my tastes have moved from super sweet mostly sugar sauces to versions boosting the cranberry flavors which bring with them loads of health benefits. Did you know the cranberry outranks nearly every fruit in disease-fighting antioxidants with only the blueberry ranking higher? Filled with vitamin C and fiber, cranberries have been associated with lowered risk of urinary tract infections, prevention of certain types of cancers, improved immune functions and decreased blood pressure. 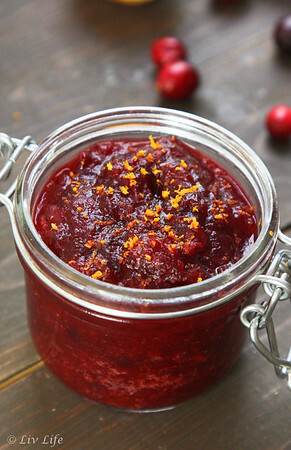 But how did Cranberry Sauce come to be a Thanksgiving tradition? A native to northeastern North America, the pilgrims most likely had cranberries available to them, however sugar was much harder to come by. As such, cranberry sauce probably did not accompany the first Thanksgiving. 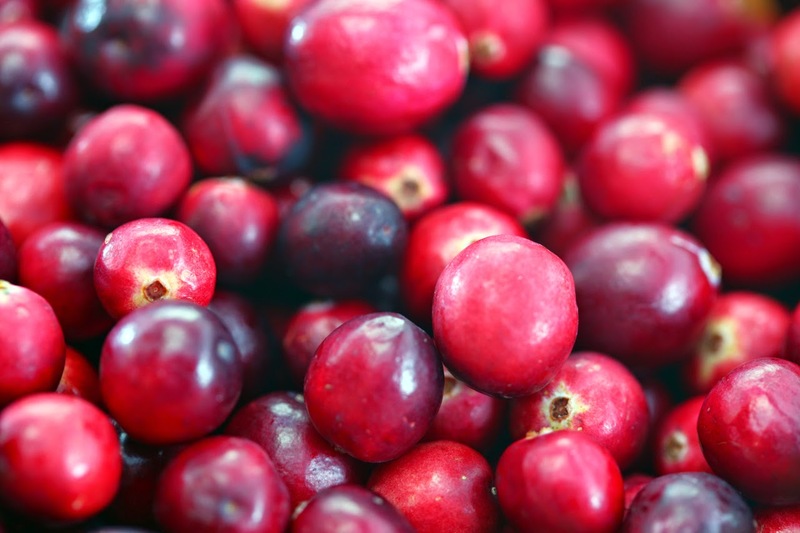 But, the Native Americans mostly likely taught the new settlers how to use cranberries and their natural preservative power - cranberries were mixed into dried meat meals to extend its shelf life. The beginning of cranberries at Thanksgiving?? Perhaps. 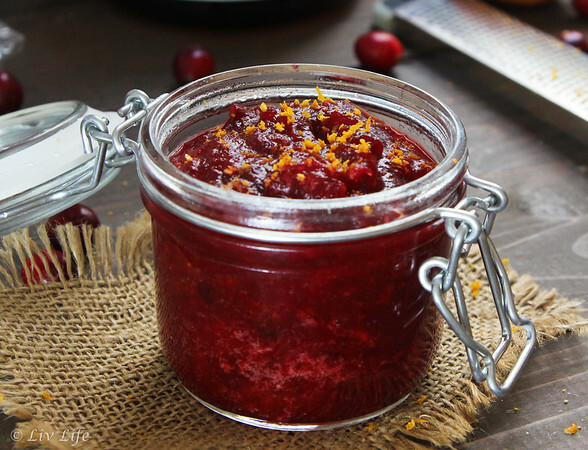 Whatever the origin, cranberry sauce is here to stay and making your own couldn't be simpler. Making a no refined sugar version this year I think I've stumbled upon a new favorite with the addition of rich pure maple syrup and sweet, freshly squeezed orange juice. The splah of Grand Marnier?? Just adding a dash of heaven to tie it all together. Happy Thanksgiving my friends, may your holiday be filled with delight! Sweet and flavorful, no one will miss the refined sugars in this holiday version. The splash of Grand Marnier simply adds a little bit of heaven! Wash cranberries and pick out the soft ones. 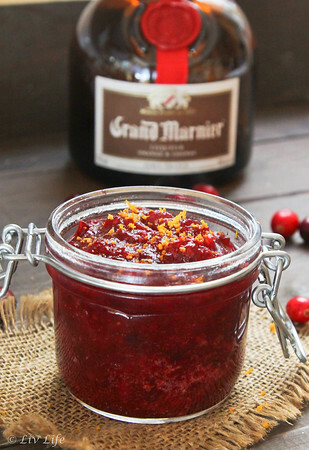 Place cranberries into a pot with the maple syrup, orange juice and zest. Heat over a medium-high heat stirring occasionally until mixture reaches a boil, then reduce heat to medium/medium-low and simmer until berries begin to pop and break down, still stirring occasionally - about 15-20 minutes. When berries are very soft, remove from heat and mash with a masher or back of a large wooden spoon. Add Grand Marnier if desired and stir to combine. Store in an airtight container in the fridge for 3-4 days, or alternatively, freeze and thaw before use. Enjoy! Awww.. thanks Krista! It's one of my favorite things about Thanksgiving! I just made Cranberry sauce this evening and it had all of these ingredients... and I only just saw your email. Yay! Great minds think alike :-) Happy Thanksgiving to you and your family, Kim! XO! Happy Thanksgiving Kim, this sounds like a wonderful combination!